Deep-cushioning posture chair approved by UK Chiropractic Doctor. Offers 24/7 usage, comfort and functionality. Seat slide mechanism enables user to simply adjust seat depth - especially useful for taller users. Adjustable lumbar pump allows user to customise level of lower back support. Back tilt mechanism allows for free reclining or locking backrest in upright position. Ratchet back mechanism allows user to adjust backrest height independently of seat. Contoured foam seat and back for extra comfort. Polished chrome 5 star castor base with double hooded swivel castors. Gas lift tested to support users up to 23 stone. Choose between fixed armrests or adjustable armrests for extra ergonomic support. Choose between blue or black fabric upholstery - bespoke colours also available (please enquire). 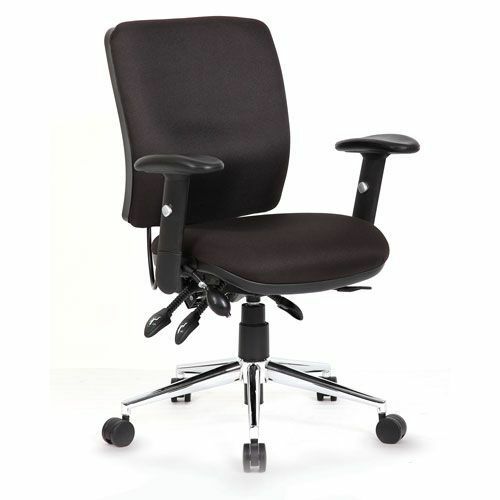 High-performance ergonomic office chair offering leading comfort, support and style.